Leeks impart a mild and mellow onion flavour to this soup. Adding streaky bacon gives a delicious taste. Easy to make, ideal for freezing, this soup recipe is a family favourite. Peel and finely chop one of the onions. Peel the potatoes and chop into 2cm (¾ inch) cubes. Fry the bacon until crispy then crumble it into small pieces. 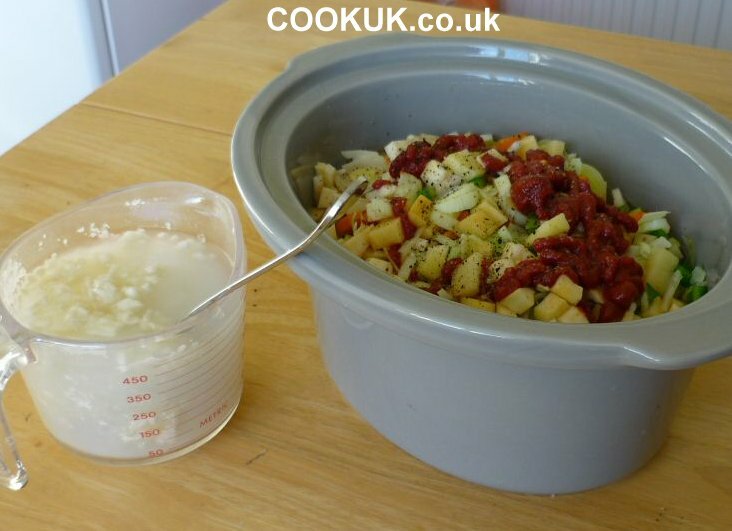 Add all the ingredients, except the remaining onion, milk, cheese and olive oil, to the slow cooker on a low heat. Stir well and leave to cook for six to eight hours. Half an hour before cooking is complete, grate the cheese. Add it, with the milk to slow cooker. Sir well and replace the lid for the last half an hour's cooking. From here on the instructions are for an optional crispy onion topping. Slice the remaining onion into thin slices. Separate out the the individual onion rings. Heat the olive oil to a medium high heat. Add the onions and stir them so that they are coated in oil. Let them fry for eight minutes or so until they well-browned. Stir frequently to ensure they are evenly cooked. Serve the soup into warm bowls. Top each soup with a portion of the crispy fried onions. Serve immediately with a good portion of crusty bread. 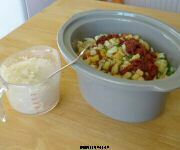 If freezing the soup, leave it to cool, add to freezer containers and place in the freezer. The soup will keep for three months in the freezer.